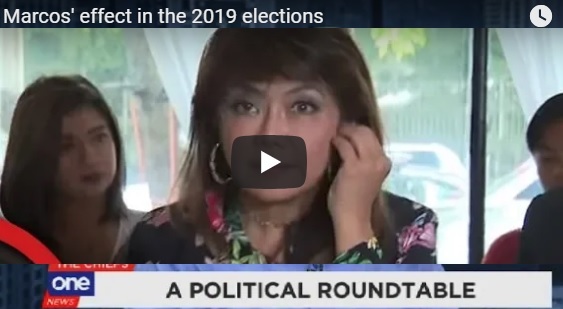 Election Riddle: If Imee Marcos Makes it to the Top 3 Senators 2019, What will it Make Bongbong Marcos in 2022? The anti-Marcos stalwarts can only deny the rising popularity of Gov. Imee Marcos for Senator in the upcoming 2019 election. However, they start to ask; Will voters care if the candidate is pro-Marcos or anti-Marcos? Political analysts and Professor, Ramon Casiple, Tindig Pilipinas Convenor. Atty. Edwin Lacierda, and Atty. Bruce Rivera debate on the issue. At one point, they insinuate that if she makes it to the top 3, then what will it make Bongbong Marcos in 2022? 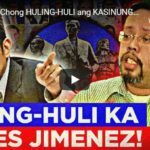 [VIDEO]: Will voters care if the candidate is pro-Marcos or anti-Marcos? Political analysts and Professor, Ramon Casiple, Tindig Pilipinas Convenor, Atty. Edwin Lacierda, and Atty. Bruce Rivera said that this is a non-factor in the voters’ decision in choosing their candidates. Political personalities seeking reelection and a return to the Senate will most likely top the senatorial elections. A commissioned survey of the Social Weather Stations (SWS) announced this recently. Billionaire Senator Cynthia Villar tops the survey with 53 percent. Senator Grace Poe immediately follows. Taguig Representative, Pia Cayetano, a former senator was next. The two are tied at 2nd and 3rd place with 43 percent each. Tied in 4th and 5th places meanwhile, are reelectionists, Senator Aquilino “Koko” Pimentel III and former Senator Lito Lapid. Former Senator Jinggoy Estrada, who seeks for a political comeback after a three-year detention over plunder charges, places 6th. Next in the list is the former senator and Interior Secretary Mar Roxas Lacierda stresses that the LP would be very happy if Roxas is indeed running. Reelectionist Senators Nancy Binay and Sonny Angara share the 8th to 9th spots. Bureau of Corrections chief Director General Ronald “Bato” Dela Rosa follows them. Completing the “Magic 12” are former Senator Serge Osmeña and Ilocos Norte Gov. Imee Marcos. As per the discussion, Marcos can still make it to the top 3 since her position jumps to the 7th from the 11th spot during Pulse Asia’s recent survey. Reelectionist Senators Nancy Binay and Sonny Angara shared the 8th to 9th spots at 26 percent each. Bureau of Corrections chief Director General Ronald “Bato” Dela Rosa follows at 25 percent. Completing the “Magic 12” are former Senator Serge Osmeña and Ilocos Norte Gov. Imee Marcos at 24 percent each. The rest of the LP bets are at the tail end. Unfortunately for the Marcos detractors, there’s a sudden rise of Ilocos Norte Governor Imee Marcos’ rank in the recent Pulse Asia senatorial survey. Its President justifies it by saying that it is not due to “an increase of her voting support.” The daughter of the late President Ferdinand Marcos climbs to the 8th spot in Pulse Asia’s September senatorial preferences survey. She is up 6 spots from her 14th place finish in the June survey. Atty. 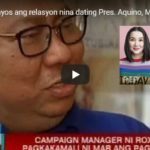 Rivera explains that since Marcos has the support of President Rodrigo Du30, she can easily gain votes from his supporters. Likewise, Du30’s chosen Presidential successor is her brother Bongbong Marcos. That can very well equate to his possible win should he runs for President in 2022. Previous post: Can Former Senator Bongbong Marcos Continue his VP Duties Despite Criticisms? Time and past has proven that your personal views are just personal. it does not have anything to fo with the public sentiments. people have learned a lot. Time and past has proven that your personal views are just personal. it does not have anything to fo with the public sentiments. people have learned a lot. You can deny that all you can but tomorow is inevitable and you will have to face reality that truth didn’t allow itself to be hidden while you continue to pretend. 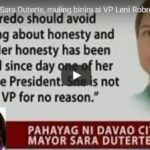 Hey Lacierda, during 2016 debates all kinds of negative attacks were thrown to BB Marcos, yet he still received more than 14M votes (probably 16M if he was not cheated). Less than 50K from Bicol. Cayetano got most of the votes in Davao, and he only got 5M votes. That is on a one-on-one vote. This time people are choosing 12. Sen. Imee Marcos already had a guranteed 16M votes plus those DDS supporters who voted for Cayetano (from his 5M votes) instead of BBM for VP and more from Bicol (800K voters).